Farmland in the Catskill country, in New York State (LOC) | Flickr - Photo Sharing! irrelephantmemory, Erik Mallinson, and 236 other people added this photo to their favorites. 1913 and in color, am I missing something?? Choopius: thats when the photographer was born. Great shot - and a great effort by the LOC to put these photos up here (this is the first one I opened). I was going to say, that seems like too good a color process for 1913. However, it is an excellent photo of a place I know well and love dearly. From: The American Image: The Photographs of John Collier Jr, University of New Mexico. "In 1941 to 1943, Collier worked as a photographer with the Farm Securities Administration and the Office of War Information under Roy Stryker and documented many areas around the eastern U.S and northern New Mexico." This is why I will never get rid of my old Pentax ME Super and K1000. Slide film still is tough to beat. If, of course, the shot is on the money. i grew up in this area and this image captures the sense of the gently rolling landscape and the way buildings fit definitively and appropriately into the landscape. Maybe I'm crazy but I think the color looks pretty good for 1943, too. Lovely photo. And there are scenes just like this here in the Catskills today. I have always lived in this area and what strikes me is how nice it is to see no power lines! I was wondering if this was John Collier as in John Collier of the BIA--I never knew about his son before. Thanks so much for the link, Greenpeace Doug! sylvieatd - close, but no cigar. You've put it on top of a gas station or similar :-) I'm guessing it's more like Route 30 between Margaretville and North Blenheim NY, or maybe Route 10 between Walton and Stamford. What's amazing is how similar this area looks today - I photograph landscapes all over the Hudson Valley and it's extraordinary! Looks like the Catskills I knew in the 70s and 80s! Just beautiful! Collier, John, Jr., 1913-1992, photographer. 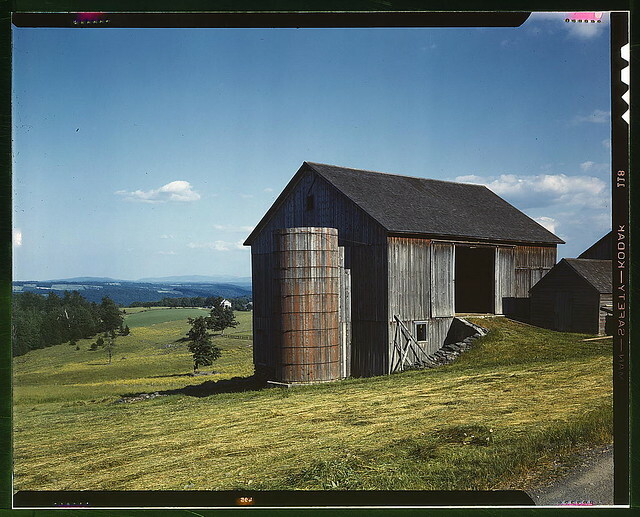 This barn looks old even in 1943 - wonder when it was built? dmalantic - any guess as to where this one is? I've driven by many such, but remember the location of only one or two in farm country just west of the Catskills. Great example of a bank barn -- build into a hillside so that there are grade-level entrances on two different levels of the building. gorgeous. both place and imaging. good job, LoC. Derby City - glad to hear that confirmation of my fuzzy memory. That's not far from here, so I hope to drive over and get a Spring 2008 shot of it. Do you live near there now, child of the 50s? I'm also thinking it might be the Churchill barn on Churchill Rd between Taylor Rd and Peck Street. My nephew has just visited me and told me that barn has been renovated and is now a beautiful home. Classic early view of the Catskills! How did they do it? Colors, they're so vivid! Can't believe it's fourties. Agreed. Not much has changed in half a century. Beautiful. Fantastic subject, the tones are superb ! Great Photo of a German Styled Barn. There are many of them all over the Eastern Coast of America. You can tell what Nationality built this barn, by the drive up, huge barn door.